Got a tattoo? Want one? Want another one? Want something unique? Once more, iOS comes to the rescue in the most unexpected way: a one-dollar app that designs tattoos for you. Oh yes. Instattoo is one of those apps that demonstrates just how versatile a smart phone can be. All it takes is someone to encounter a problem, and dream up a solution that fits on a small screen. Of course an app like this is only ever going to appeal to a small minority of a small minority of people. Only some folk ever get tattooed at all, and only some of them are ever going to want the large, extravagant and complicated tattoos suggested by this app. But for those people, it’ll be a big help. For one thing, it’s an idea generator. 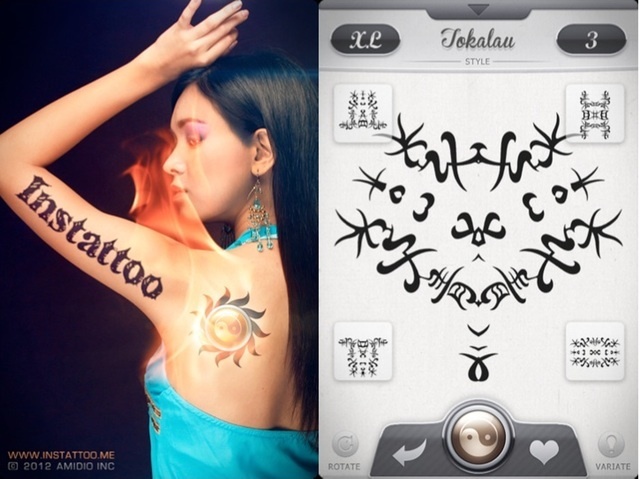 There are 13 built-in tattoo styles, and five more available as in-app purchases. I think the developers are being generous there – they could very easily have done it the other way round. In each style, there are different design modes with varying approaches to complexity and symmetry. The big randomize button (with a Yin/Yang symbol on it) generates something new every time you tap it. It could do with being more random – at the moment, it only works within the confines of the currently selected style, and retains the rotation symmetry of the preceding design. It would be better if it randomized everything.